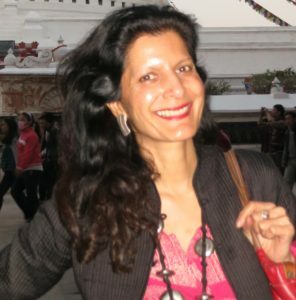 Mohini Malhotra is a development economist, organizational facilitator, and founder and CEO of shakti llc (www.artbywomen.gallery), a social art venture to better women’s and girls’ lives globally. She worked at the World Bank from 1995 to 2014 in various leadership capacities with a strong track record of quality implementation and results. While at the World Bank, She founded and managed CGAP, a global multi-donor funded program focused on financial inclusion, particularly for women; led a program on slum upgrading and housing for the poor through a global partnership, Cities Alliance; headed the South Asia program based in India on building client capacity across a range of topics (governance and accountability, HIV/Aids and health systems, urban development), in partnership with civil society organizations; and advised governments in Africa, Latin America, Eastern Europe and Asia on small business and private sector development initiatives. In her last position at the World Bank she managed the Leadership and Staff Learning Department and chaired the Learning Board. She has received leadership awards for her consistent performance in leading teams towards effective and high quality results. She is currently an Advisor with Gender at Work, and with the Partnership for Transparency Fund, and recently earned a certification in the Art and Design of Facilitation from Georgetown University. Prior to the World Bank she worked in several economic development focused consulting companies (Nathan Associates, Development Alternatives Inc). Mohini has a B.A. in Development Economics from the University of Minnesota, a Master’s in Business Administration from American University (Rome, Italy/Washington, DC), a certification in Facilitation from Georgetown University, and has participated in several leadership development programs at Harvard and other institutions. She is originally from Nepal, speaks Spanish, Italian, Nepali and Hindi, and is the author of numerous publications on economic development issues, and more recently, of literary fiction.